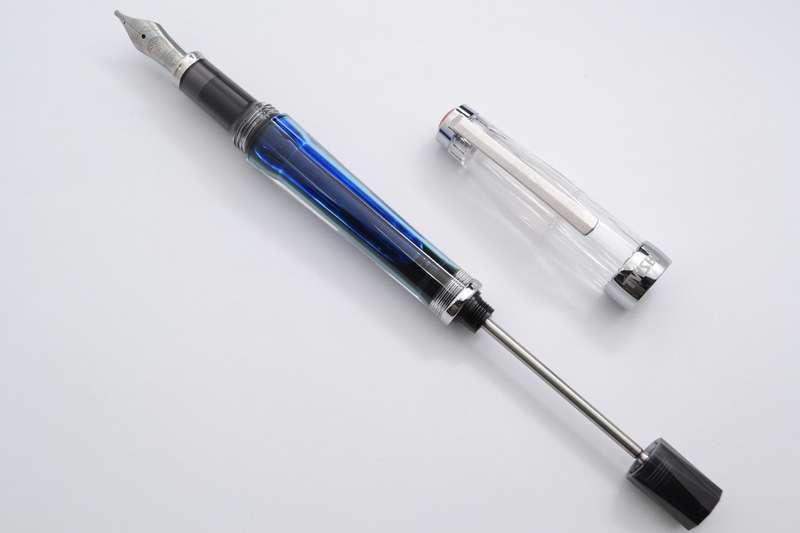 TWSBI is a Taiwanese fountain pen manufacturer that has been around for about half a decade now and for some reason they never really called my name. While in Taipei earlier this year I wandered into a fountain pen shop and walked out with a couple of TWSBIs, a Vac 700 and a Micarta. When I picked up the Vac 700 for the first time I was impressed with how nice the pen felt. The body is made out of a laminated polycarbonate and compared to my other plastic and even celluloid pens it feels much nicer; more sturdy and more satisfying to interact with. The design of the Vac is a bit of a pigs breakfast, mixing a bunch of different materials and shapes and yet somehow it actually looks pretty good (maybe not elegant but attractive in it’s own way). 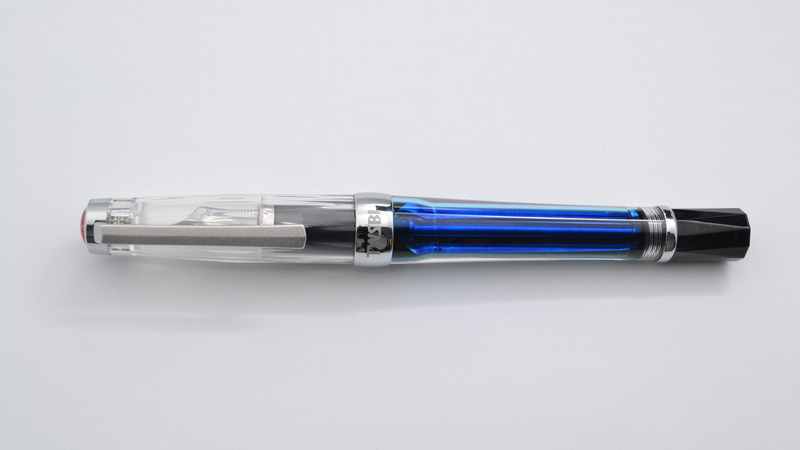 The polycarbonate is ultra clear and as a result the pen looks quite beautiful when filled with ink. The cap and the blind cap have a sort of diamond shaped faceting to them while the barrel is rounded with a slight taper to accommodate the vacuum mechanism. The section and blind cap are made out of a translucent grey polycarbonate and all of the furniture except the clip is chrome. The clip has a very rough almost sandblasted aluminum look to it. It is rough to the touch but feels quite solid. 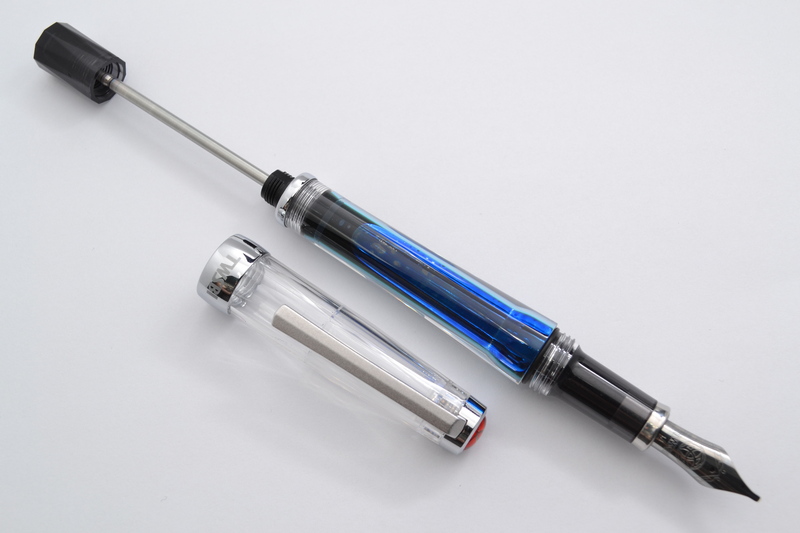 The finial has a red jewel with the TWSBI logo. The cap band has big inelegant branding on it. The vacuum filing system holds a good amount of ink and with some practice you can get about 2ml of ink into the body which is four times the capacity of your average converter. With the blind cap screwed down tight, air is shut off from the filing system making it airplane friendly. So far I have flow with it on eleven flights and can report that there have been no problems. It doesn’t leak and it works beautifully at altitude. The downside to the air shut off is that if you wish to write more than a couple of pages the blind cap needs to be unscrewed to keep the ink flowing. The Vac 700 is about 14.5cm long and weighs a hefty 32.6 grams. The pen posts nicely but for my smaller hands it throws off the balance so I use it uncapped. 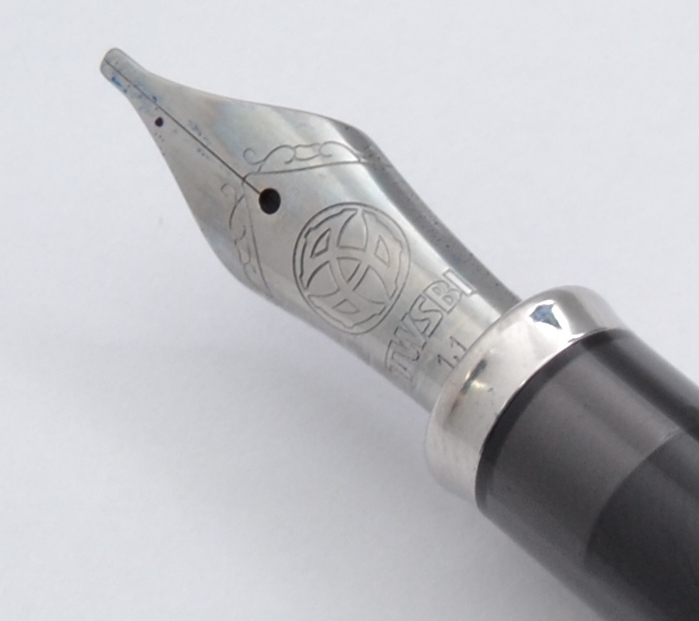 The large Jowo nib is nicely proportioned with the rest of the body. The 1.1mm stub point is a joy to use. No performance issues to speak of. I LOVE this pen. This is my new favorite sub $100 pen that I have tried and I am hard pressed to think of a $200 pen that I like better. Previous Post Smythson MEGA Review Part 3 – 12 Writing Papers Reviewed! 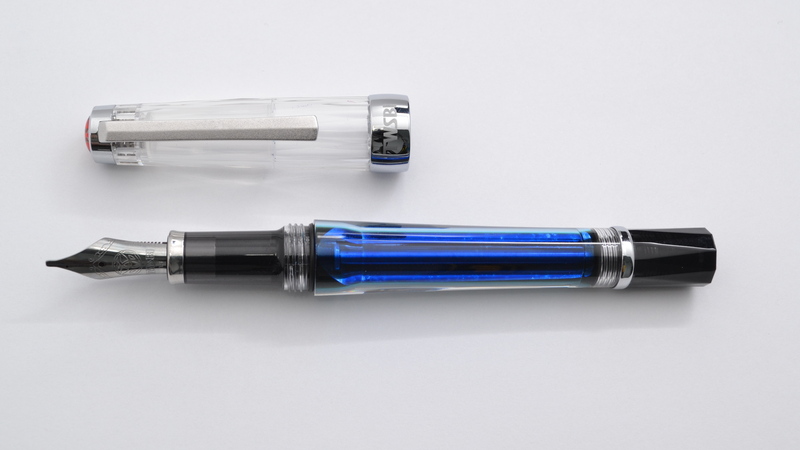 Nice review thanks, you were able to describe some of the attributes that I really like about the pen but failed to eloquently put into words. I have had the pen for a little over a year now and just don’t find myself reaching for it that often. That air tightness is good for flying but I find it slightly annoying when the feed dries up and requires attention to restart. Thank you for your comment! I do admit that it is an inconvenience but it’s a small one for me and at least with a stub nib I can feel when it’s starting to run low such that I can avoid any skipping caused by a dry feed. I have also had one about a year and I love it too. I also have the 1.1 nib and it is a great writer, giving a lovely swashy line. It seems to write wider than my Lamy 1.1 so is not so good for small spaces (like my Techo planner). It compliments that pen (and my Pilot Metropolitan Flat M which is great for fine writing) for headings and bold words. Thank you for your comment! 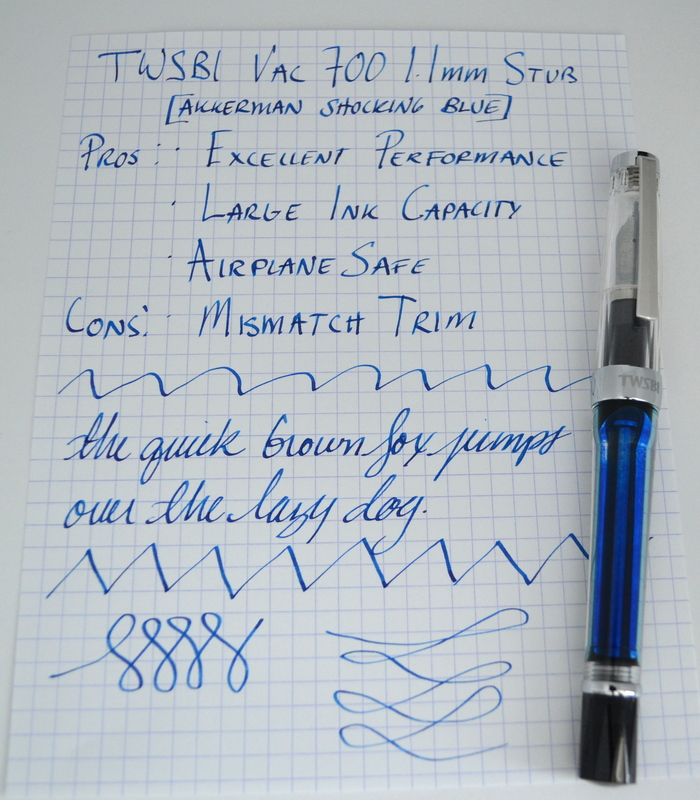 I have a Lamy Safari with a 1.1mm stub and I agree that the TWSBI is quite a bit wider.